Hot Spots. They’re here—the new question type that will have a direct impact on assessments AND student outcomes. Now that we have them, let’s chat about how to leverage these items to better engage students with course materials to improve student preparedness for licensure exams and clinical rotations. Check out the five methods below to learn more! In health sciences education there is the constant balancing act of preparing students for board exams while also making sure they are ready to interact with patients on clinical rotations. In a perfect world, we would do both at the same time. Enter Hot Spots. 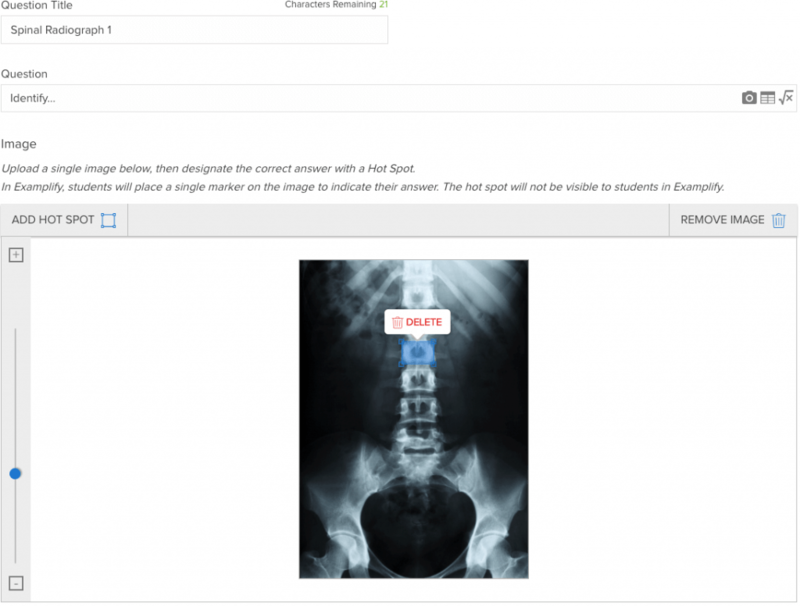 Through Hot Spots questions, students can be assessed on course and board related content while getting the visual repetitions needed to prepare them for their clinical experiences. In addition to patient care content, a great utilization of these items is to prepare students for their next clinical experience with formative assessments. Okay, we all know this is that fastball right down the middle that Hot Spots questions hit out of the park. Need students to identify a body structure in preparation for lab? Or maybe where they should perform a specific procedure? How about assessing students on the tools they’ll be using to treat patients in the clinic? Lab and clinic time have their limits; prepare students for their profession by teaching and assessing them in this more practical way. Don’t forget about those formative assessments though! As you retire Hot Spots questions from being used on exams, turn them into practice exams for students to use outside of class. Best practice tip: Use Hot Spots items as follow-ups to multiple choice questions on both formative and summative assessments. For example, create a multiple choice question that asks students which treatment procedure to use given a certain patient presentation. Follow that directly with a Hot Spots item prompting students to locate the area of the body in which they should initiate this procedure. There it is again—that fine line between productive repetition and boredom inducing redundancy. It is a struggle to find appropriate ways to revisit content without losing students in the process. How about … wait for it … we achieve these goals with Hot Spots? Educational research indicates that having planned repetition over an extended period of time leads to better retention. Low-stakes formative assessments using Hot Spots items throughout the curriculum will create this repetition while not overwhelming students with too much content. Best practice tip: Create practice Hot Spots formative assessments for students to take on their own as they advance through their didactic and clinical years. Use your assessments to provide necessary feedback to students on their performance to allow them to self-assess and prioritize which content areas they need to practice. In addition to strategic repetition, including images with text during instruction leads to long-term retention and improved student outcomes. Studies show that students perform better on assessment when provided visuals with text when learning the content. Furthermore, it is important and fair to students to assess content similarly to how it is taught (this also helps to keep learning objectives, content, and assessment all appropriately aligned). Therefore, using Hot Spots is an ideal method to assess students when using images in instruction. Best practice tip: Use Hot Spots in pre-test/post-test assessments to drive instruction. Have students complete a pre-test assessment, including key images for the day’s lesson. Review student results real-time on these items. Use this information to help focus your instruction on the items where students performed poorly. Close class with the same Hot Spots assessment you used to open class to confirm students learned the necessary content that day. Want to see if your internal student assessment data is in line with the studies referenced in this blog post? You can do that! Just like all other assessment items, Hot Spots items can be tagged to categories to learn more about student performance. Don’t stop there—evaluate student performance in areas that correlate with board content. This method allows us to identify in which content areas students struggle most and then create a data-driven remediation plan for each student. Best practice tip: Use this data as proof that these new instructional and assessment methods are improving student outcomes on your internal exams…and better preparing students for board exams (don’t forget to record this as a scholarly activity for your CV!). 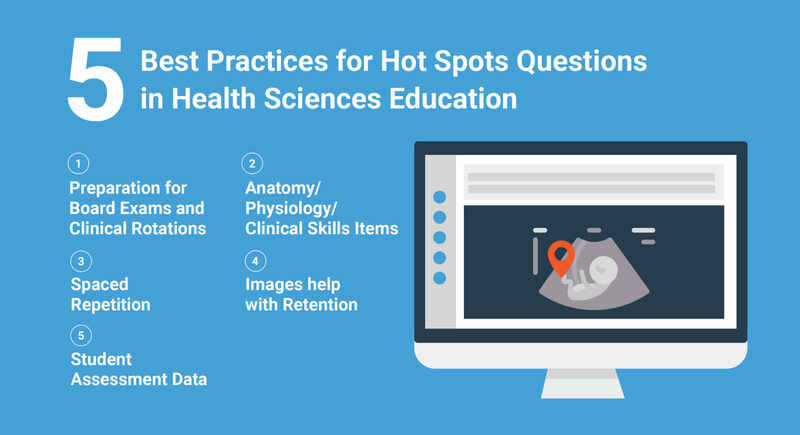 Hot Spots are more than just a question type—they’re a catalyst for improving our assessment practices and driving improved student outcomes in health sciences education. Isn’t that our end goal as educators? Ready to learn more about Hot Spot questions from ExamSoft? Check out all the information here. Bui, D. C., & McDaniel, M. A. (2015). Enhancing learning during lecture note-taking using outlines and illustrative diagrams. Journal of Applied Research in Memory and Cognition, 4(2), 129-135. Carpenter, S. K., Cepeda, N. J., Rohrer, D., Kang, S. H., & Pashler, H. (2012). Using spacing to enhance diverse forms of learning: Review of recent research and implications for instruction. Educational Psychology Review, 24(3), 369-378. Kang, S. H. (2016). Spaced repetition promotes efficient and effective learning: Policy implications for instruction. Policy Insights from the Behavioral and Brain Sciences, 3(1), 12-19. Dan holds a Master of Science in Technology Enhanced Learning and a Bachelor of Science in Adolescent/Young Adult Education from the University of Dayton. His background as a secondary-level educator drives his research and professional interests, including the appropriate use of summative and formative assessment and how the data they produce can be used to positively impact teaching and learning. An ExamSoft client for over eight years, Dan currently is the Senior Manager of Education and Assessment at ExamSoft. His background includes assisting faculty at Oklahoma State University Center for Health Sciences and Kent State University College of Podiatric Medicine in course design and development, while also introducing new methods of utilizing educational technology in assessment and instruction to create a learner-centered environment.